DECATUR, Ga. -- A three-hour manhunt that blocked roads in Georgia during the height of rush hour Friday morning has ended with a suspect's arrest, the Atlanta Journal Constitution reports. 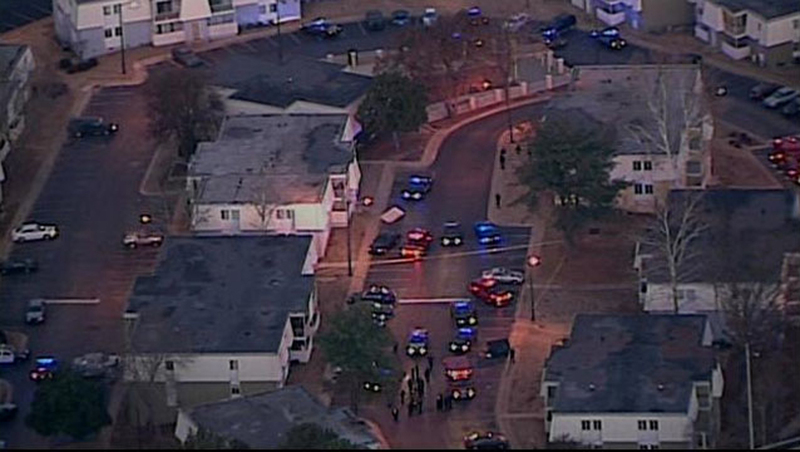 The hunt began after two police officers and another suspect were shot around 7 a.m. at an apartment outside Atlanta. Police soon began searching for the second suspect, reports CBS affiliate WGCL. Around 11 a.m., police reportedly tracked down and apprehended that suspect. The officers were responding to a home invasion call at the Colony Ridge Apartments in Decatur when they were shot just before 7 a.m. Friday, reports the station. They were shot with a high-powered rifle, reported the Atlanta Journal Constitution. The officers were reportedly alert and breathing when they were taken to a hospital. The condition of the suspect who was also shot at the apartment wasn't immediately clear. Schools in the area are on lockdown as the manhunt continues. Hours later, a second shooting was reported at a Home Depot about three miles away, reports the Journal Constitution. It wasn't immediately clear if the two incidents were related.